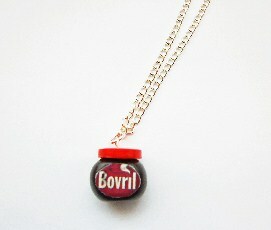 The ultimate Bovril style necklace. Unique cupboard food item made from polymer clay. Each jar measures approx: 19mm. 18in silver plated curb style necklace. * Sizes, appearance and shape may vary slightly from picture due to being handmade.